The emotional pain that accompanies hair loss and balding caused by Alopecia, cancer, chemotherapy, burns or other illnesses can be painful for anyone. For a child, though, it’s devastating. Launched in early 2014, the Harmony of Hope Foundation, Inc. (HoHF) believes that no child should have to suffer in silence. 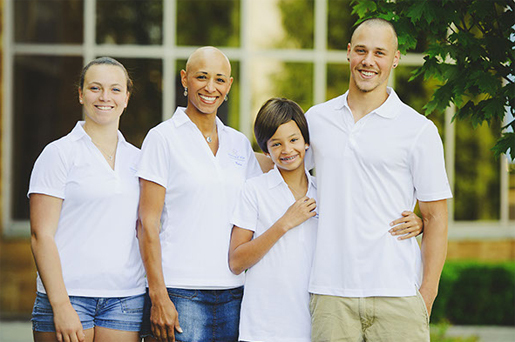 “We strive to provide short-term and long term solutions for children whom have lost their hair and aid in helping them regain their strength and courage to feel comfortable in their skin again,” says Mara Caldwell, founder and president. Caldwell has suffered from Alopecia Universalis for the past 15 years and Alopecia symptoms for over 28 years. While in the early stages of her experiencing this autoimmune deficiency disease, there were no support groups and very little information about the disease, symptoms, causes or a cure. She felt many times that she was suffering alone and that there were “no services to even provide direction or detail on the ‘why’ behind her illness,” says Caldwell. There is still very little support groups or free programs out there today. HoHF located in Dayton, Ohio has a goal for 2015 would be to expand out to the states surrounding Ohio, has dedicated their work to raising the level of awareness and acceptance of children’s hair loss through forming strategic alliances with medical, beauty fashion industries and children’s health organizations. “The three colors in our logo signify the categories of focus: Gold for All Children’s Cancer; Purple for All Cancers and Royal Blue for Alopecia; encompassing serious illness that cause hair loss or baldness,” says Caldwell. Through HoHF, a much needed dialogue will be opened that will address the psychological, social and medical impact of hair loss on children and their families. The dialogue opened by and for children with all forms of hair loss on subjects that are rarely addressed or known. Multiple dialogue platforms, both online and in public, coupled with high profile and broad-based appeal awareness events, are currently set and being developed. Launch activities will include a series of fundraising events, live seminars and “How To” courses in the Dayton-Cincinnati Metropolitan areas of Ohio, in addition to an online forum. Some things that the organization offers are: in-home consultations, volunteer mentorship programs, “how to” courses and seminars, support groups and customized wigs. Caldwell also owns the Belle of Hope Beauty supplies where it has aided her in partnering with dozens of manufacturers and business to purchase products at very low costs. This allows the HoHF to offer free services and products to clients under the age of 21. The price range to purchase wigs or wig kits for wigs and wig packages are from $0 to $1,400. Some upcoming events to lookout for include Get Cute for a Cause with a Twist Fundraiser on June 7, 14 and 28, the Annual Mason Pub Golf Outing on Aug. 9, the First Annual – Bald and Beautiful Charity Ball on August 22, and the First Annual Harmony of Hope Poker Run on Sept. 13. To get more information about the Harmony of Hope Foundation and their events, visit them on Facebook.